As much as I obviously have a thing for chucking soft plastics like the DoLive Stick around - and for me the hit on a lure like this that’s rigged weedless and weightless is always such a thrill - catching bass off the top is also one hell of a buzz. Like many of you I am sure, I have played with any number of different surface lures over the years, and I have caught bass on a number of them as well - but I bet if you looked in my lure box, more often than not you’d find the IMA Salt Skimmer and the larger, heavier Xorus Patchinko II (the 140mm one) in there. These are my default surface lures if you like and to me each is suited best to certain conditions. And because there’s a considerable gap between the 110mm/14g IMA Salt Skimmer (which seems to defy its dimensions and frigging fly) and the 140mm/25g+ Xorus Patchinko II, I have always kept my eyes and ears open for a surface lure that sits in the middle. Do I need a lure that sits in the middle though? 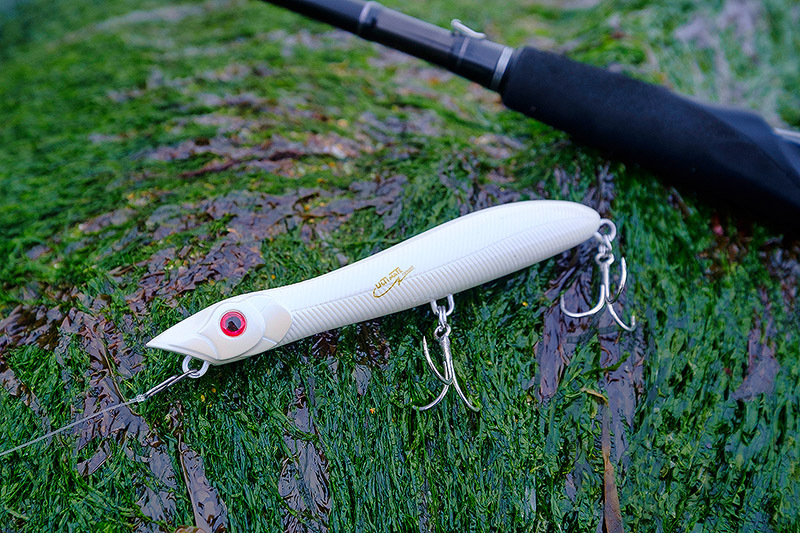 Well that is open to debate of course, but I’d like one, and whilst there’s no way my blog post here from a few years ago remotely influenced Ultimate Fishing over in France who do the Xorus brand, I am rather pleased that we now have this new Xorus Patchinko 125 (125mm, 18g). There must be something about the way the bigger Patchinko II works across the top that seriously does it for bass, because to me there is no getting away from how successful this missile of a fairly substantial surface lure has been since UK anglers switched onto it - and I am giving Mick of Mr. Fish over in Jersey the credit for this as he was the tackle dealer who first introduced Ultimate Fishing products into the UK - Xorus, Tenryu, Tackle House, DUO, Decoy, etc. Credit where credit is due if you ask me. Same with the IMA Salt Skimmer and how well it’s done for me over the years (full credit to Nick at Bass Lures for opening me up to the IMA brand some years ago now), and I did get rather excited when there was a larger and heavier “Skimmer Grande” introduced via IMA USA a while back - but it casts about as well as a banana, and as much as I am sure it works well for bass, if I can’t cover a decent amount of water and perhaps into a headwind as well then I tend to leave that particular surface lure alone and go looking for something else. 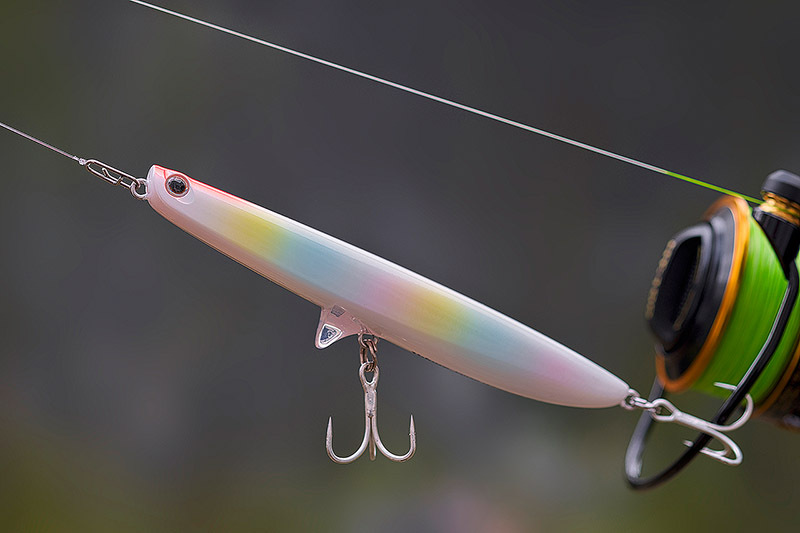 I’ve fished with a few surface lures that fit in the middle, and some of them are of course brilliant lures - obviously you’ve got the killer Lucky Craft Gunfish 115 (115mm, 19g) that I know doesn’t leave the boxes of a few very good bass anglers, that Tackle House Vulture (120mm, 20g) that I stumbled upon in the Ultimate Fishing catalogue a while back, the Xorus Frosty that I know works well for many anglers, and then a surface lure that I really like but I can’t recall seeing any other anglers using - the Daiwa Morethan Scouter 110F (110mm, 19g). I have just seen that there’s a heavier version called the Scouter 130F (130mm) which weighs a substantial 31g and going by how well the 110F version casts I would hazard a guess that this Scouter 130F absolutely flies! But there must still be something about that Patchinko sort of action on the top, and now that we have this brand new, medium sized Patchinko 125 which to me fills a logical gap in the Patchinko range (I know plenty of anglers love the smaller Patchinko 100, but I’ll take the IMA Salt Skimmer over it), well I am pretty damn excited to see how it’s going to do. I have fished with it a little bit to see how it casts and works and it was a relief to see that if you catch it right it absolutely flies - longer drop, get that timing spot on, holy cow it goes, and casting it that little bit lower into a decent bit of a headwind the other evening proved to me that it’s a comparable distance machine to its older brother when you take into account the different sizes and weights. I think it’s pretty fair to have some high hopes for this rather lovely new Xorus Patchinko 125, but as ever, time will tell. Do I need a new lure or two? Let’s no go there! Is using a thicker braid leader a case of me missing something blindingly obvious, or is it just overcomplicating things? Breathable waist waders - where have you been all my life?